Responding to customer feedback, Scenic has revamped its New Zealand offering with a selection of enhanced Scenic Freechoice options in the new Pristine Wonders of New Zealand 2019/2020 brochure including a new Taste of the Bay tour sampling local olive oil chocolate, cheese and honey, and day trip to Akaroa now includes a cruise with opportunities to spot dolphins; penguins and fur seals. 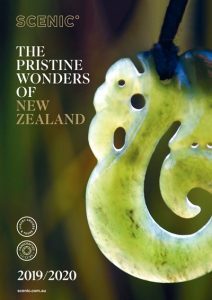 The Pristine Wonders of New Zealand 2019/2020 brochure features six itineraries ranging in length from six to 24 days, across the North and South Islands; including a six day tour focused on the beautiful Bay of Islands and the 24 day Ultimate New Zealand program covering both North and South Islands. In conjunction with the release of the brochure Scenic has unveiled a variety of great Earlybird savings, with offers including savings of up to $1,400 per couple. Earlybird savings of $300 per couple of any journey of nine days or longer. 24 Day Ultimate New Zealand from Auckland to Christchurch includes a private tour to Tane Mahuta, the massive kauri tree known by the Maori people as “Lord of the Forest”; Scenic Sundowners overlooking Hokianga Bay; a dedicated day trip to Cape Reinga, the most northerly point of New Zealand; wine tasting at Mission Estate on Napier and an overnight stay on board Milford Mariner amidst the majesty of Milford Sound. Prices start from $9,385 per person. 15 Day Royal New Zealand from Christchurch to Auckland includes an exclusive Scenic Enrich experience meeting with team from Weta Workshop responsible for moves like the Lord of Rings trilogy; travel the TranzAlpine rail across the Southern Alps; and an Scenic Enrich tour of the award winning Hamilton Gardens in Rotorua. All Scenic tours feature accommodation at the finest hotels available such as the Auckland Grand Millennium and iconic Te Waonui Forest Retreat set in bushland near the charming village of Franz Josef; Scenic Freechoice sightseeing and exclusive Scenic Enrich experiences, the services of an expert, hand-picked Tour Director and knowledgeable local guides; return airport transfers, all tipping and gratuities.